With Unibet Bonus Money, we offer you a defined bonus amount to play with - it's that simple! Unlike other bookmakers, though, winning bets placed with Unibet's Bonus Money include your stake (we don't exclude it from winning Bonus Money bets like other bookies). We also allow you to split up your bonus into individual bets and only the original bonus is subject to 'turnover' requirements, not any bonus winnings. View the comparison table below to see how you get more value with Unibet! Note, to release your bonus balance to withdrawable cash, you must meet any advised Bonus Wagering Requirements. These usually include minimum odds ($1.40), turnover requirements and an expiry period. What are the three different balances in a Deposit Bonus? There are three different balances in a Deposit Bonus. Contributed Money is money you deposit to qualify for a Deposit Bonus. Once your Deposit Bonus is awarded, you must first play with your Contributed Money within the Bonus. The progression of any Deposit Bonus Wagering Requirements commence as soon as you start placing bets with your Contributed Money. Please note, if the Validity Period expires, or the Bonus is cancelled, your Contributed Money balance will be converted back to cash. If you would like to withdraw the money you contributed to the Bonus before it is completed, simply press the 'Cancel Your Bonus' button in Active Bonuses or phone Customer Support on 13 78 68. Upon cancellation all Bonus Money awarded and winnings within the Bonus will be voided. Bonus Money is the money Unibet contributes to your Bonus. This money is not converted to cash until the Bonus has been fulfilled. This money will not be converted to cash in the event of the Bonus expiring. This money is used after your Contributed Money to fund bets within the Bonus. Cash Balance is the money you currently have in your Unibet account as cash prior to making a qualifying deposit. If all your Contributed or Bonus Money has been used, bets for this Bonus will then draw from your Cash Balance. This money can be withdrawn at all times. Learn more about the Deposit Bonus. Why did I not receive a sign up bonus offer when I registered? 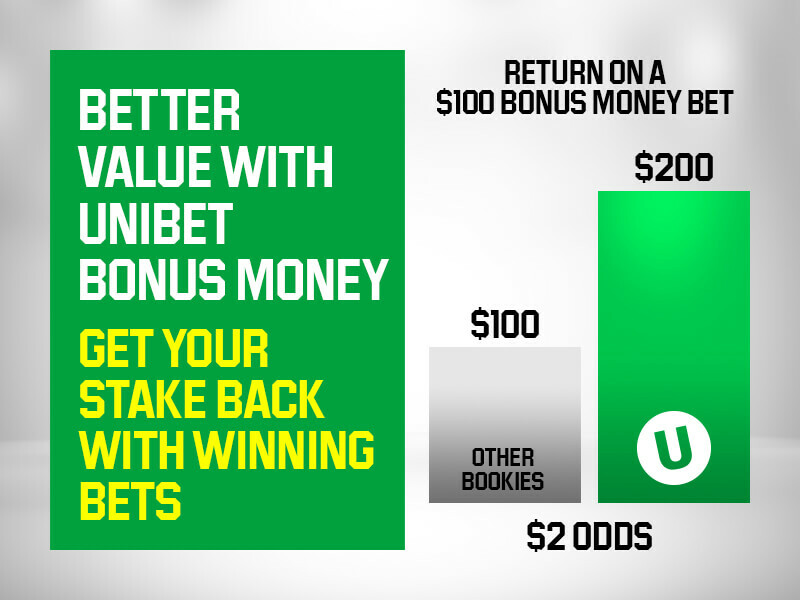 Within Australia not all customers are eligible for a welcome bonus offer when registering an account with Unibet. If you are located in the Northern territory, Tasmania and Canberra you will then be entitled to a welcome bonus offer. Please note all residents from New Zealand are entitled to a welcome bonus offer. If you believe you are entitled to a sign-up Bonus, please contact Customer Support. In most cases, to release your Bonus balance to withdrawable cash, you must meet any advised Bonus Wagering Requirements. These usually include minimum prices, turnover requirements and an expiry period. In other cases, you'll be required to make certain requirements (for example, stake $100 on an event) in order to get a reward – it might be cash or an insurance bet. Why can’t I withdraw my bonus money? But, to release your Bonus balance to withdrawable cash, you must meet any advised Bonus Wagering Requirements. These usually include minimum prices, turnover requirements and an expiry period. For example, a Bonus awarded with 4X wagering requirements within a Validity Period of 30 days, at odds over $1.40, will require you to wager (‘turnover’) $80 ($20 X4) within 30 days. Once you’ve completed the Bonus Wagering Requirements we convert the bonus money into cash and you can withdraw it. In a Deposit Bonus, If you would like to withdraw your current Contributed Money balance at any time, simply press the 'Cancel Your Bonus' button in Active Bonuses or phone Customer Support.